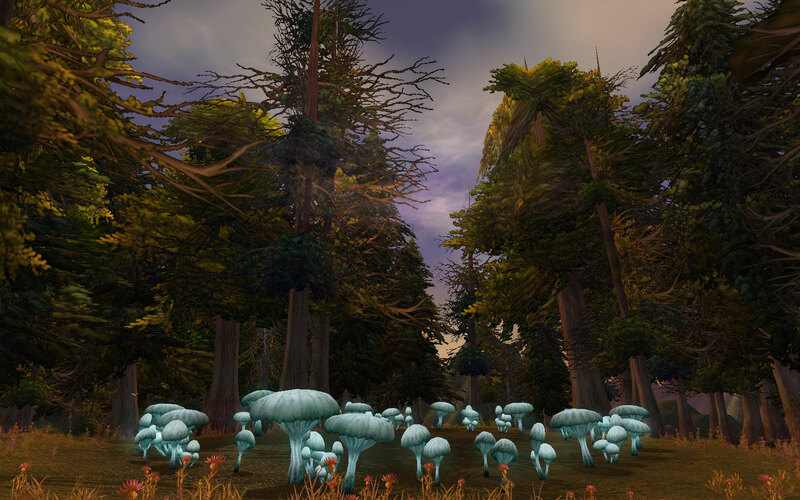 The Whispering Forest is a subzone west in Tirisfal Glades. Pre Cataclysm it was just an empty unfinished area. Now it’s a forest with many secrets. 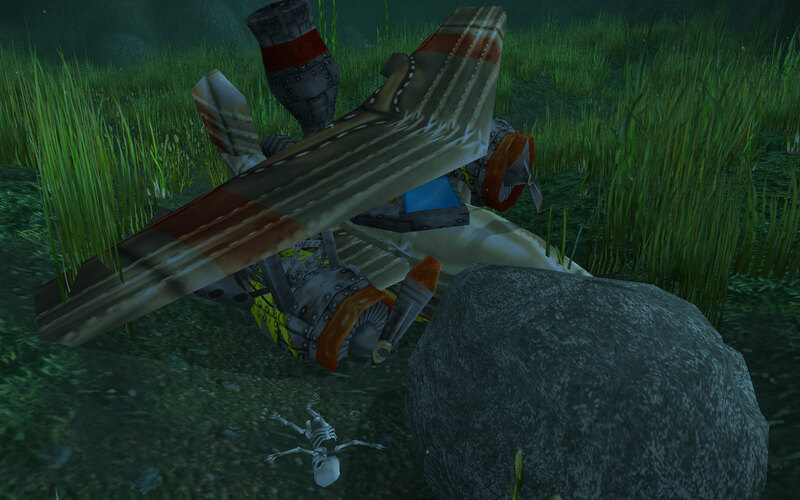 There is a big lake with a crashed airplane on the bottom, beside the plane is a gnome-like skeleton. 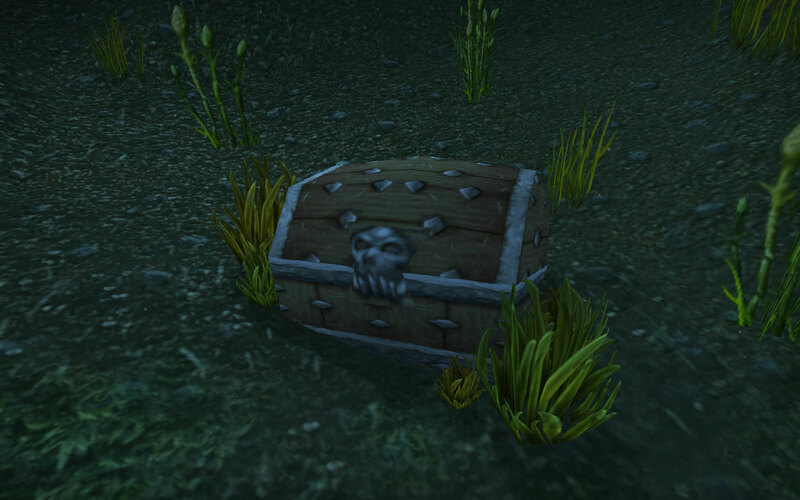 A chest with a skull on can also be found in the lake. On a small island in the lake there is a skeleton with a sword in the back and a fishing pole in the hand. There is also a chair with an umbrella and box of fishing tools. Many rats can be found in the zone and there are stags and fawns in the forrest, the small ones which look plagued or infected by something. I wonder why. 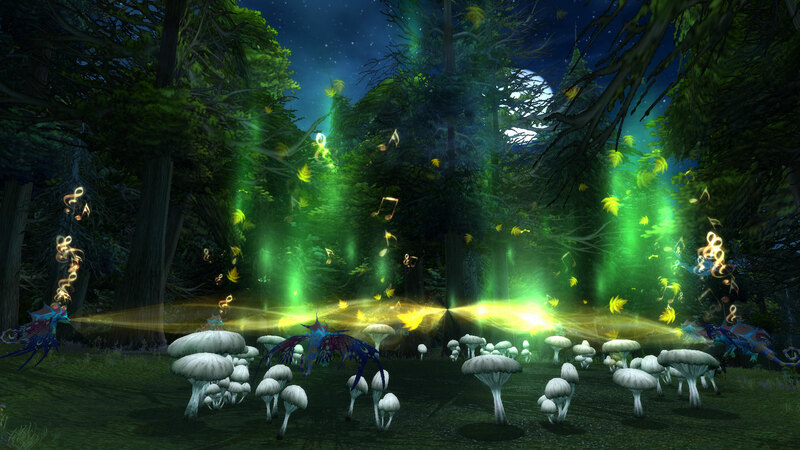 The most mysterious thing is a ring of glowing mushrooms in the forest which I will tell you more about. I have actually been there several times but not much happened there so I left, then I had no idea about this amazing event which happens every 6 hours or so. It was a coincidence that Zampano and I went there late one night and we had read something about dragons spawning but had no idea what they would do, or do anything at all. 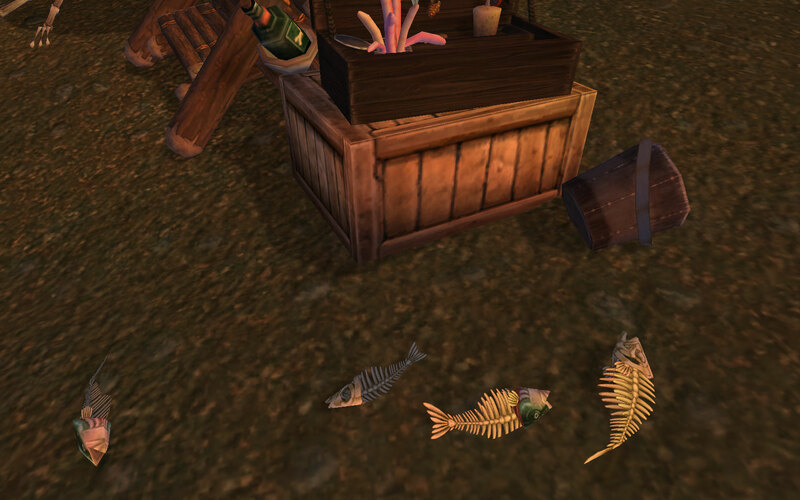 When we arrived there were a few Fey-Drunk Darters there and more spawned. 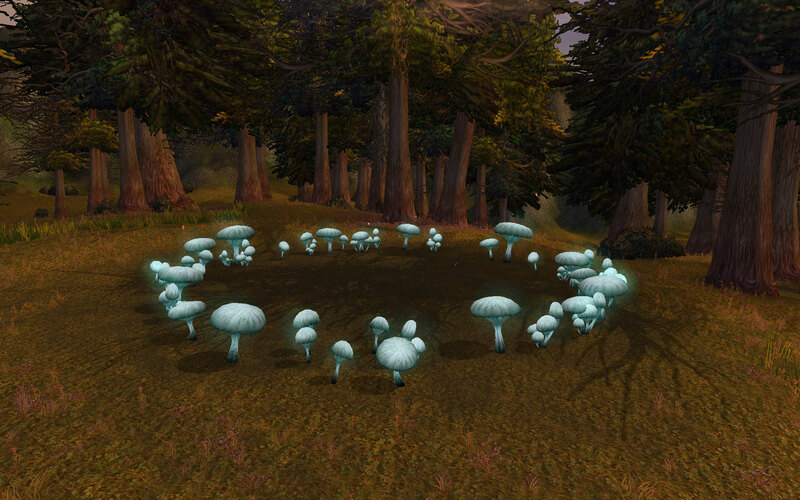 We sat there a while and just looked at them, when they suddenly flew towards the ring of mushrooms and started channeling these golden beams towards a portal in the center called Faerie Circle. The music changed and notes appeared over their heads like they were singing, this beautiful and mysterious and magical song. Never heard anything like it before. The deers in the forest gathered around to watch. It lasted for about 2-3 minutes, then they despawned. I felt stunned and amazed by this event. Why would such a beautiful event take place here, where people never are, or it’s not like you have a reason to go there if you don’t know about it. Maybe it’s for a later patch or something? I hope so, so people get to see it, but still I kinda want it to be a secret. Cause I love these hidden, secret places people usually miss as they rush through quests and other things. I like to have more time and explore everything, every little corner of the map. But I still think there has to be more, or would they really do that much for a 3 min event in a place like that? If you wanna experience this event you just need to have time to camp the place, wait and be patient. I’ve no idea about their spawn times, they might change or even be random. But some people have said every 6 hours but it doesn’t seem to be 100% correct. It takes about 40 minutes from the first dragon spawns till they all seven have spawned, and then about 10 to 40 minutes more before the even actually starts. First time we saw them was at night, when it was dark and the moon was shining, but the video I frapsed in the afternoon so sun was still up. Have to say it was most magical during the night. Thanks for the compliment. 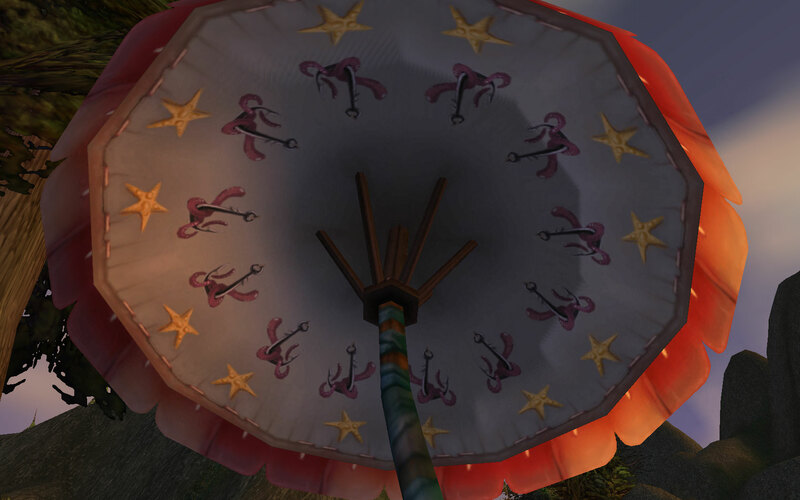 I’m so happy people find these little ‘secrets’ in WoW. Like the real world, there are so many hidden treasures if we keep our eyes open. There is a script you can write ingame to play the song, you might have to copy it and then retype the ” signs for it to work. 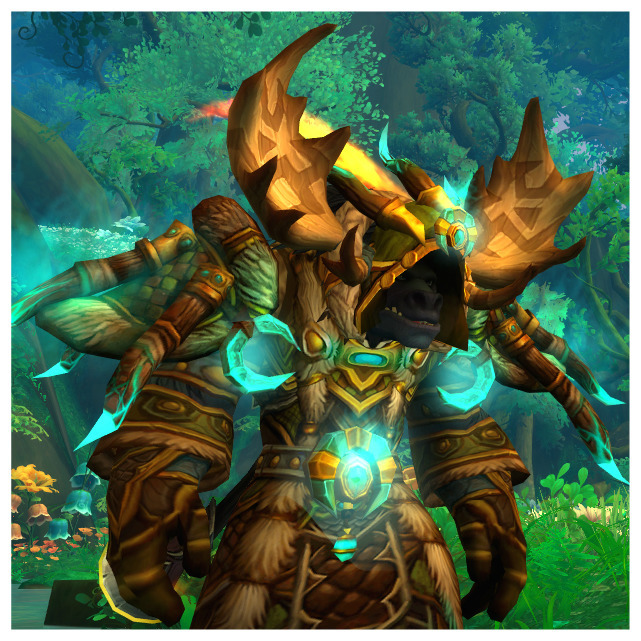 If you want to read more about secrets and hidden places in WoW, be sure to check out other adventures and secrets I’ve explored and the podcast Warcraft Less Traveled who also had a show about the Whispering Forest. 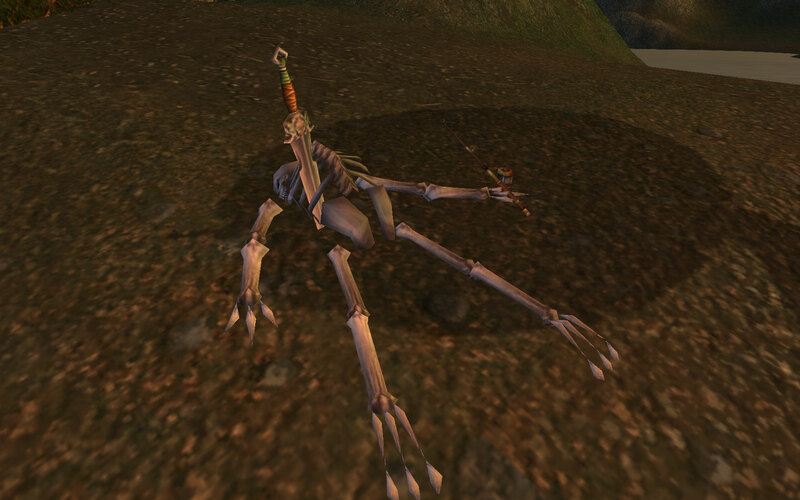 You can also read more about the lore behind the Whispering Forest on WoW Insider Know Your Lore and What’s happening in the Whispering Forest. Awesome! It’s nice to know that even with Old World Flying and the complete revamp of the world there are still tiny, unknown corners of it filled with magic and mystery. Thanks for finding this and bringing it to light! Yeah, I’m so happy there still are a few secrets around. 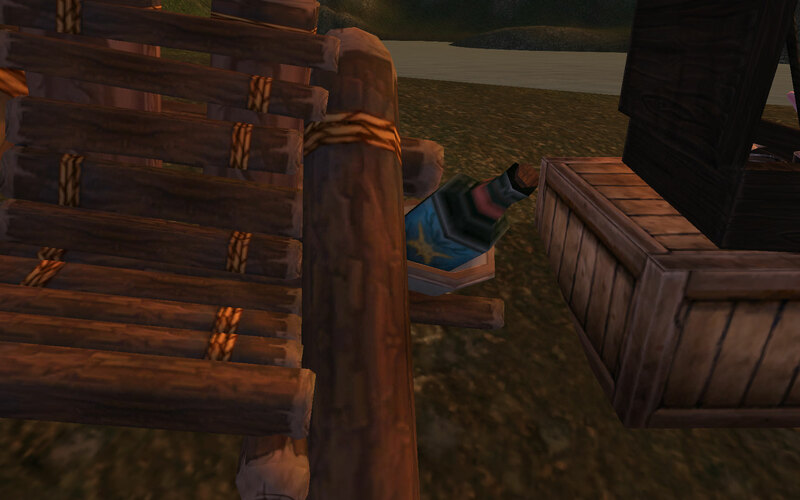 So sad when they removed all my old favorite places like the tauren farm and Quel’thalas.. I’ll try to find some more less known places or fun things and write about them aswell :) Thanks for reading! Yup, it is nice to know there is some mystery in the game. That is so neat. 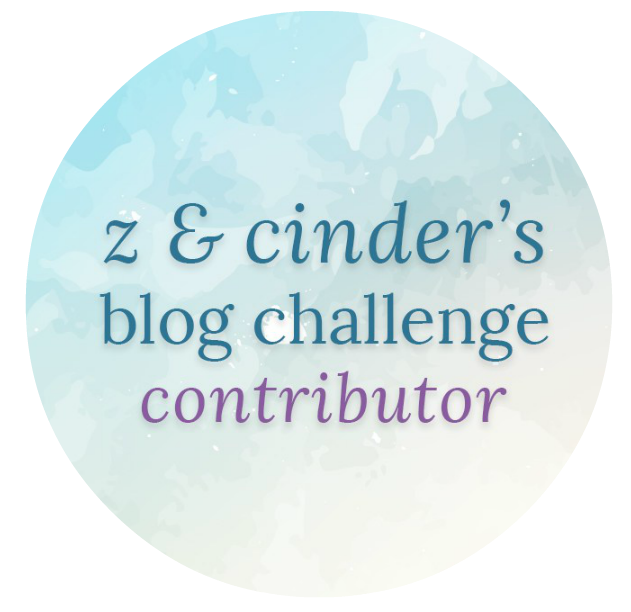 It was fun to stumble across this post today as well, because just last night someone in the guild was talking about the area. I hope we get to know more about the place, cause it’s a mystery and I really wonder if there is a story, or of course there is, but if we ever get to know what they are doing and why. 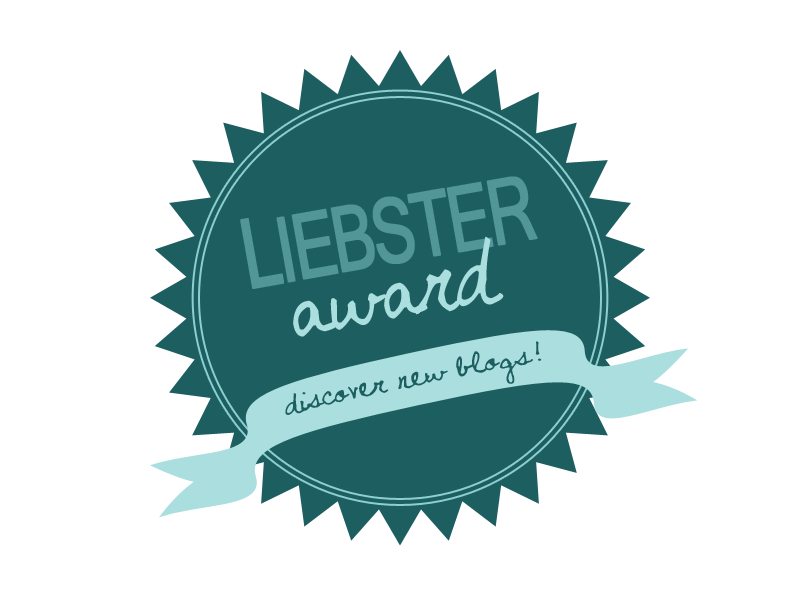 Mm, I’m also playing for small things like this. Some people might not care, but I loved this :D Hope we’ll find more secrets and magical things! When does the event start? Midnight server time, then around 6, noon, etc? Or does it start at a random time and cycle from there? I would love to see this, but I don’t have 8 hrs to camp it. Hm, that’s the problem.. I’m not sure. As I wrote in the post I don’t think there is an exact time, but I’m pretty sure it’s every 5-6 hour and from the first Fey-Drunk Darter spawns it takes about 40 min for all seven to spawn, and then it might take another 10-30 min before they start. I have seen it three times, first time it started 01:45, second time 18:10 and third time 00:09, I think.. So I think it varies cause the spawn time and time from all have spawned till it startes can vary, and therefore the time of the next spawn changes. And it might even be different from server to server, I don’t know. But that’s also part of the fun that you don’t know. 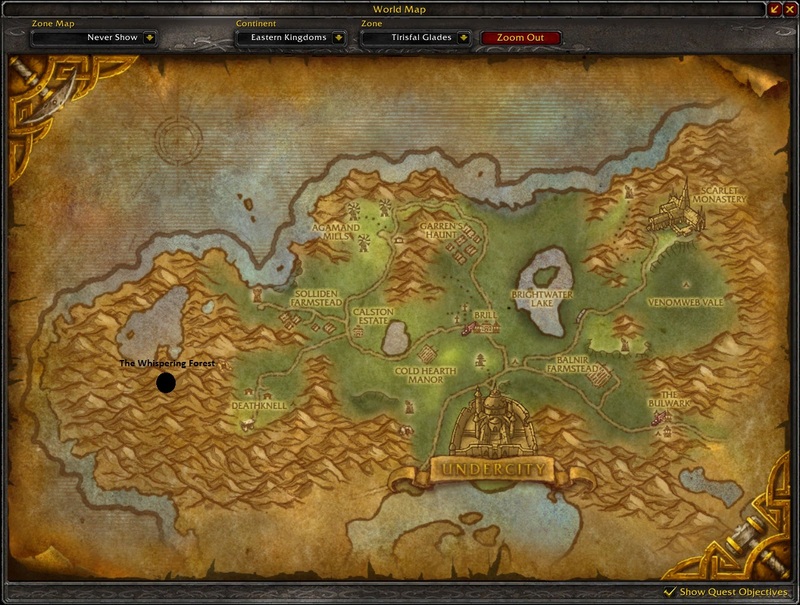 I don’t know if its been brought up yet, but this location is where it was said that the blood elves settled first when they traveled to the Eastern Kingdoms. However, they sensed a “great evil” under the ground and many of them started to go insane so they moved to the location they now reside. There was a lot of speculation about this area in earlier WoW days, where it displayed differently on the map (it didn’t look like a full mountain range, it looked like there was a valley that could be another -albeit small- zone). Thank you for sharing your find! I have been meaning to check this area out because of what I knew about the high elves exile, but I guess other activities in Cataclysm got in my way and I forgot all about it! 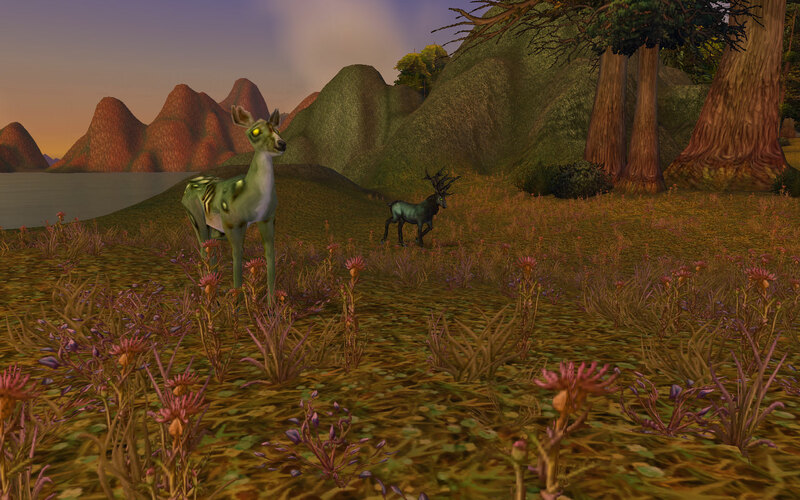 I dont see it mentioned here but you need to check out the area just west of Thunder Bluff, in the hills, (far enough away for alliance, if you are one, to not get killed by TB guards or flag up) where you can find a host of tiny animals armed to the teeth; rabbits with machetes, mice with sub machine guns, beavers wearing army helmets…I like going there for a giggle. I’ve heard about them :) Critter war. Maybe I’ll go there some day, thanks! Wow, I went there before patch 4.1.0 where I can see this event was added. 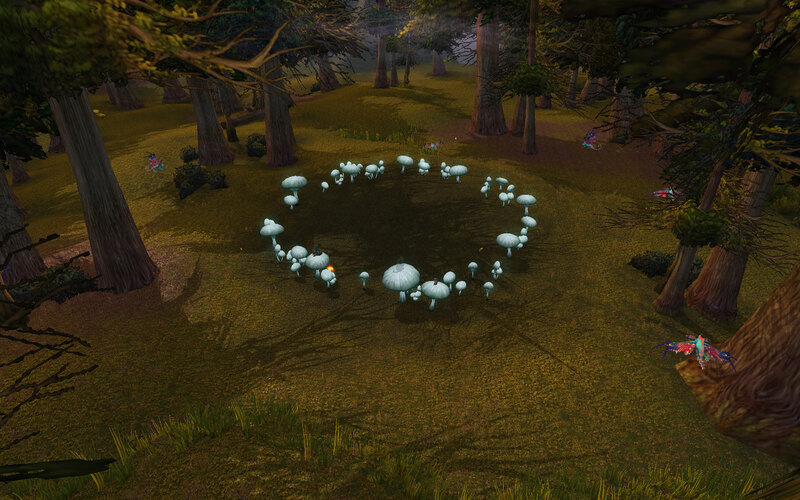 Before then there was literally just a mushroom circle and no darters, very creepy at that time. When they develop on this area, it makes me wonder what their plan is for this place. 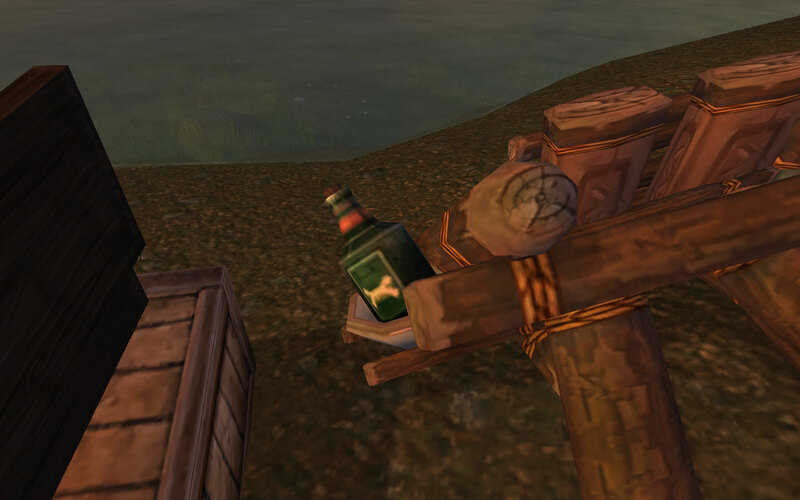 By the way, I’ve documented all the bits of secrets and hidden locations I could find around Azeroth here: http://ironyca.wordpress.com/2010/12/23/secrets-and-hidden-locations-in-cataclysm/. I added your video and a link to your article. Awesome to find more exciting easter eggs, so keep it up! It works here, it’s just that you have to change the ” signs with own, like retype them. Not sure why, but doesn’t work when you copy paste them but when you retype them it works, at least it works for me now when I tried. Took me a while to find the soundfile, don’t remember exactly where it is located. How do you reach this place??? I tried many times but I can’t find a way through the mountains. They are impassable. I can’t use a flying mount because I’m playing the Starter Edition (level cap is 20). 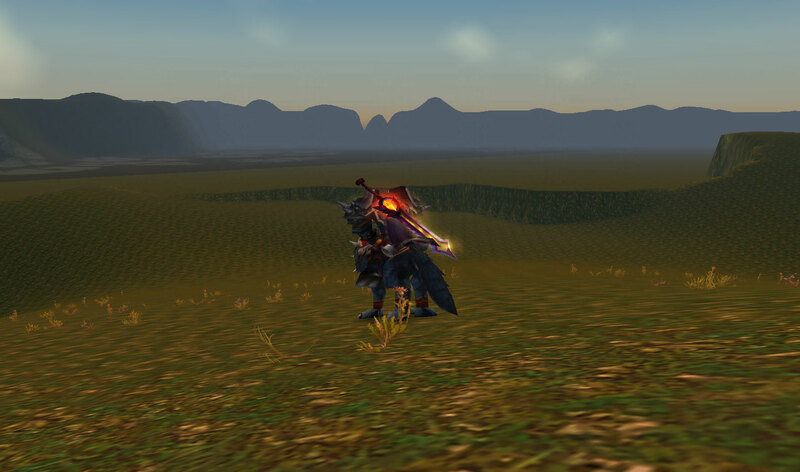 It was possible to get up there without flying mount in TBC, from the north side, but it was hard and I think it required a fast mount and the riding crop for extra speed and some patient cause there were some difficult jumps. I haven’t tried it later, but they might have changed the mountains around so it’s impossible. 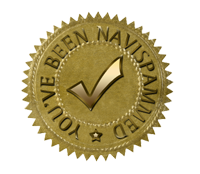 You just have to try I guess or ask on some forums. Maybe a friend can summon you up. That´s a great catch. I hope they will continue developing old areas as time goes by and not just leave them behind. Who knows what WoW will look like in 4-5 or even 10 years? They´re changing the graphics engine a little bit each expansion.. the game certainly looks better overall today than it did a few years ago. 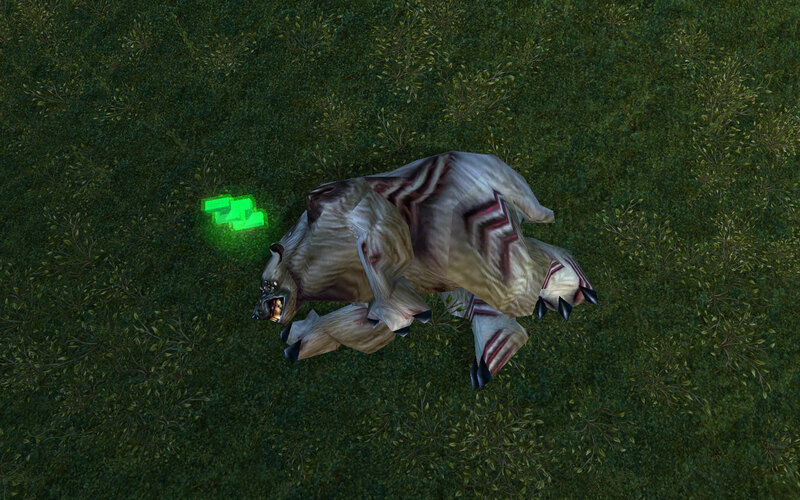 What a great read, and screenshots giving an idea of what to find :) Every day I use the Druid Beacon teleport toy, and more often than not, it has teleported me right in the middle of the circle. I want to find more places like this. 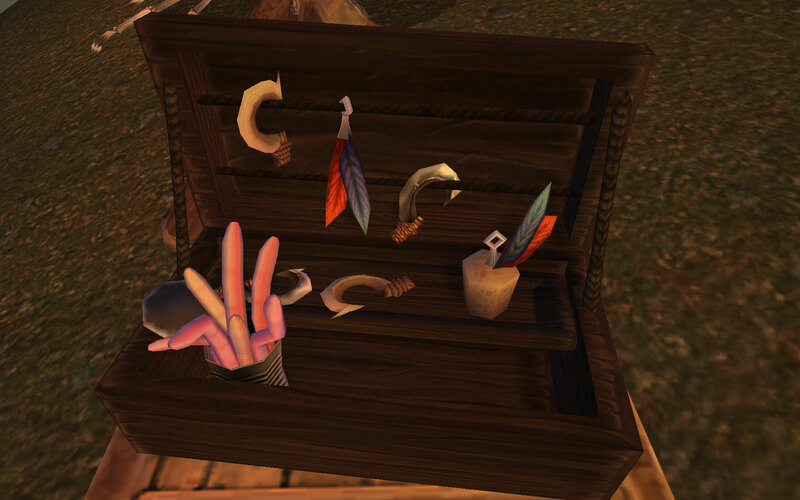 The revamp Catalysm brought made so few places “undiscovered”, since all the quests takes you to everywhere, so linear. So I really appreciate places like this.